Napton-on-the-Hill is a beautiful village set in the rolling hills of Warwickshire with a population of just less than 1,000. This web site provides an historical perspective of its past & present in terms of its families and people. Visitors can see for themselves the charm and tranquillity of an old, well established and very English village. day and morrow after the Feast of the Assumption of the Blessed Virgin”, (August 14,15 & 16). Neither market or fair exist any longer. In many places in and around Napton, may be seen Extensive Medieval strip systems where long departed villagers grew their crops and it remains basically an agricultural community. Unlike much of Warwickshire, Napton was not part of the vast Forest of Arden, but was “feldon” or agricultural land which was not densely wooded. Local houses were stone built and not timbered as in neighbouring areas. The De Napton family lived in one of the long lost manors until their last heir, a girl named Jana married Adam, one of the Shuckburgh family during the 14th century. Since that time Napton and Shuckburgh, two miles distant have been linked in many ways and are now part of the same parish group together with neighbouring Stockton. The church of St. Lawrence dates from the 12th century, was rebuilt in the 13th century and has later additions. 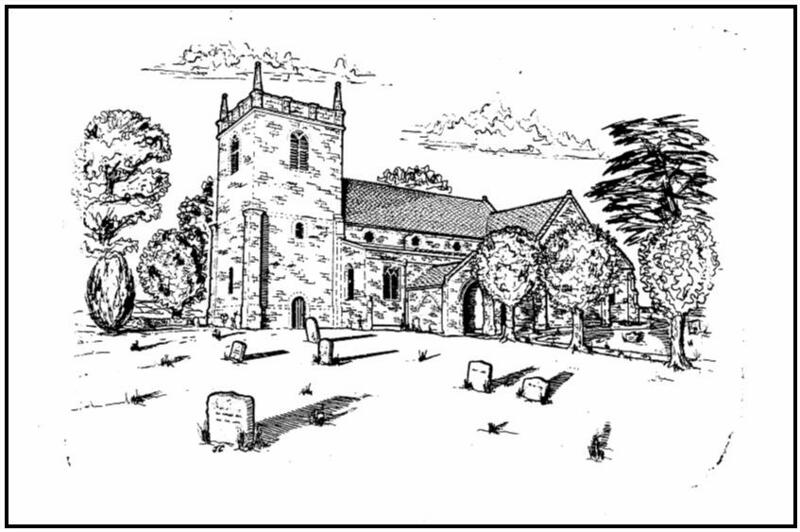 Originally the rector of Napton was the Prior of Coventry who received its tithes but engaged a vicar to perform his parochial duties. Marks on either side of the chancel arch seem to indicate that the building once possessed a rood screen. Until quite recently a large gallery stretched across the west end of the building and is remembered by older parishioners. On the vestry door is a strange grill covered by a heavy shutter. Nobody knows the purpose for which it was intended; a spy hole or maybe a confessional; who can tell? An ancient wooded chest dated 1624 and given by Thomas and Isabel Gariet of Napton at that time is one of the churches treasures: rustic in style but a tangible link with past worshippers in this holy place. top overlooking the village nestling below, and its squat tower has withstood the buffeting winds for centuries. ringers who occasionally enjoy the challenge of a Quarter Peal. An old set of hand bells still exist and their sweet notes still ring out joyfully at Christmas and other festivals. Napton possesses its very own Christmas carol entitled “Fleecy Care”, this was probably written by a local person in the late 18th or early 19th century, and it was bellowed out by local men during the festive season, often after their tonsils had been well oiled with ale. night and passed on. Next day he was told that the ghostly “parishioners” were regular worshippers. Several present day villagers say they have seen them but who they are/were nobody knows. The old Methodist chapel was until recently a Nickelodeon theatre and is now being converted into a house, The Christadelphian chapel on Pillory Green is still in use and the Congregational chapel is a private house. 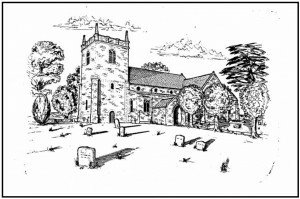 Chapel Green, on the edge of the village is named after a 14th century chapel which once stood on the site. Nothing of it now remains but excavations have revealed Roman and Saxon relics and it is probable that an earlier village was situated here. Nearby is the old Welsh Road, along which drovers walked their cattle from the distant Welsh hills to the markets of Buckingham and London. The most dramatic building in Napton is undoubtedly the windmill, which was restored in recent years. 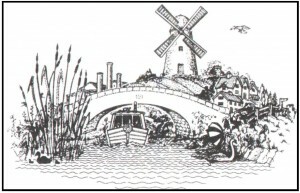 Originally there were two mills and old maps clearly show them situated quite close together. Records of the mill date back to 1543, but it is probable that an earlier mill existed on the site. A spring and well lie within the grounds going deep down into the hillside and providing a never failing supply of pure water. There is a footpath leading down from the windmill to what used to be the Napton Brick and Tile works where a large proportion of villagers used to earn their livings. Bricks and tiles marked with the windmill stamp were produced from local clay and fired in the longest kiln in Europe. They were transported by canal boats which moored alongside the works on the Oxford canal. A small industrial site now occupies the site. The Oxford canal, constructed in the 18th century, sweeps around Napton on three sides and is a contour canal and not a “cut”, and follows the lowest natural features of the countryside, creating a pleasant meandering route unlike most other waterways. During the nineteen fifties the canal was in danger of being abandoned, but the coming of pleasure craft saved its life, and now colourful narrow boats ply its length and three marinas bring pleasure and employment to the area. The Grand Union and Oxford canals join up at Napton and the old wide basins provided for converging boats remain. 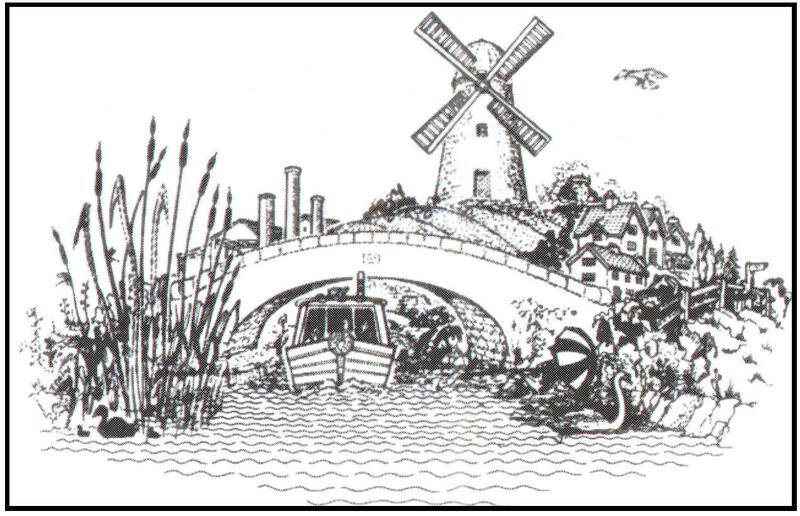 Old boatmen, often transporting Napton bricks, used Napton windmill as a landmark. Local family names such as SHEASBY, EADON, DUCKETT, & GRIFFIN still exist amongst the villagers. Napton was famous for the nicknames it gave its residents and appellations such as SQUELCH DUCKETT, WAG GREEN, SNODGER COX, WAGGO ALSOP, GRUNT GRIFFIN, FLIGGER TARRANT, SHIRTY BALSAM, TRADDLES EADON and FAGGY DUCKETT are recorded. Until 1948 Napton had separate schools for boys and girls but at that time they amalgamated and became St. Lawrence Church of England School for mixed infants and juniors. Local secondary schools received the older pupils on them reaching twelve years of age. Now that school too has closed and the children transferred to a large new building which was opened in 1997 to serve the needs of Napton and surrounding villages. Education has come a long way since children were taught on the stone benches of the church porch. Napton remains a lively and attractive place in which to live with an active community who enjoy the various clubs and sporting activities as well as rural pleasures. The Windmill Singers are a local musical group who entertain people all over the county and every year a village pantomime is produced which creates hilarious entertainment for the villagers enjoyment. side for the very first time. On returning home he was asked his opinion of the mighty ocean and after pausing he replied, “Its no better than Napton ressy”. Like that old man, many people living in Napton feel that it is a beautiful and impressive place in which to live, and one which bears comparison with other lovely Warwickshire villages. The folk who live on the hill welcome you to their village and to the W.I. Compiled by Monica Evans from information supplied by Napton WI members and other villagers. The intention is to create a “village life” diary to reflect some of the things that happen on a day-to-day basis – the highlights [and sometime the low-lights…] as pressures on rural communities start to ramp up as a result of the current financial crisis.